For 8 weeks every year, FOUND becomes a whimsical Christmas Shop. This is our 5th holiday season in Kerrytown and things are off to a festive start. Last week, the local newspaper Ann Arbor.com sent a photographer and we were on the front page of the Sunday edition (above the fold, even). Thanks to everybody who stopped and mentioned it! Click on the link to read the article. Although we're not quoted in the article, our friend Vicki at Heavenly Metal and other locally owned businesses are. Our strategy has always been to have a unique mix of merchandise at Christmas that includes lots of new little things in the under $10 range that make good stocking stuffers and hostess gifts. We have a great selection of candles, including Green Daffodil Soy and glowing snowflake candles that are made in Michigan. 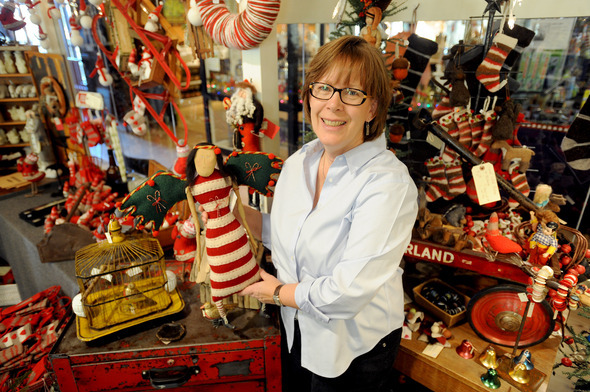 Add to the mix wonderful handmade items like the wool angel by Greta Chirco and felted ornaments by the Au Gres Sheep Factory, plus vintage sleds & ornaments and that antique yellow bird cage. This is a fun place to shop for unusual decorations and gifts. For 8 weeks the magic continues!